Winning Teams deliver winning behaviours consistently. It is not until we engage in action that our pursuit of any performance goal can become a reality. We may believe we are focused on what we truly want, and we may believe we have the positive mindset to attain our goals but if our habitual behaviours are not in alignment with our aspirations then a winning performance will remain unobtainable. Behaviour is positioned as the third element in the performance triad because it is almost impossible to change any existing habitual behaviour in the absence of either a clear focused vision or a positive mindset. 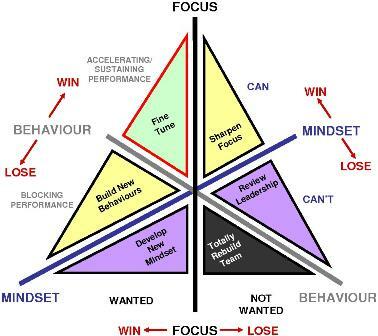 Our experience shows that the best path to eliminating blocking performance behaviours is to focus attention on the development of more desirable behaviours that either accelerate performance or sustain performance to maintain the optimum balance between the two in alignment with your focused vision of an overall winning performance.